The Deputy Prime Minister visited Yeovil last week to discuss an initiative to boost local economies. 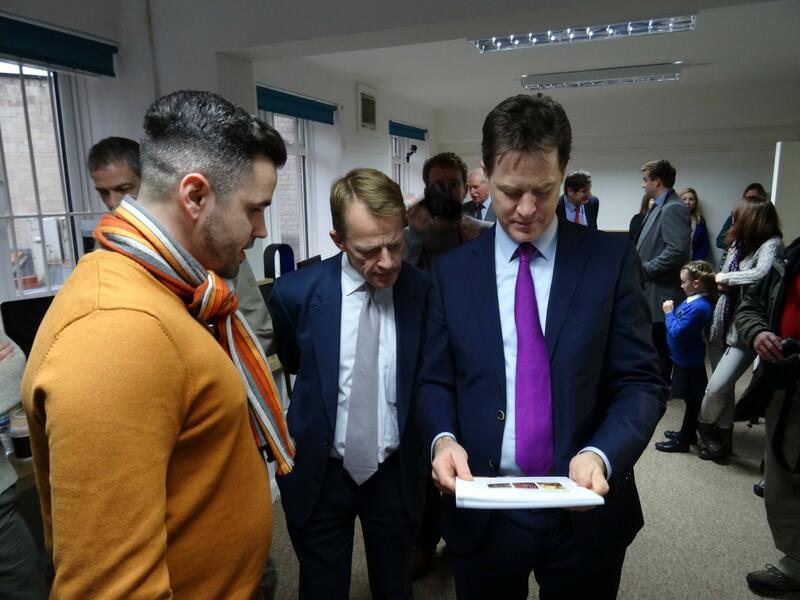 Nick Clegg met with local MP David Laws and a Yeovil based website and app design firm, Lupimedia. He was here to announce an investment of an extra 1bn in local economies with the government’s Growth Deals. The money will go to local authorities, giving them, not Whitehall, the decision of what is best for their local area. Funding for broadband networks in areas where provision is not currently available, such as remote or rural areas, including: £6m for the Heart of the South West that will contribute towards tackling the next 5% of premises in hard to reach areas (matched with £6m of local funding) and £3.6m for Cumbria to extend availability of Superfast Broadband to an additional 5,000 premises. The Tolgus and Barncoose junction improvement project (£5.9m matched with £1.7m) will create a gateway between Redruth and Camborne in Cornwall, unlocking access for over 600 homes, 5,000 sq. metres of commercial space, and the Kresen Kernow cultural project. £8.7m investment in Greater Birmingham and Solihull to create new training facilities, in Solihull and Birmingham, helping to address skills shortages in key sectors of the local economy. £25m (£5m plus £20m local match funding) towards the development of a National Maritime Systems Centre of Excellence in Portsmouth. This centre will focus on maritime and marine capabilities, safeguard and create jobs as well as increase exports. £5m for the Institute for Advanced Manufacturing at Nottingham University, which has match funding from the University and industry of £95m. This project will train over 3000 manufacturing engineers and deliver research and knowledge exchange worth £60m. £4m to expand Engine Shed in Bristol, the highly successful business incubation facility. This investment will provide further incubation and grow on space for high tech companies. This investment will be matched with £5m of local funding.